They do look yummy. Not a big fan of raisins…cran or otherwise but I would probably at least try it. They’re really good! 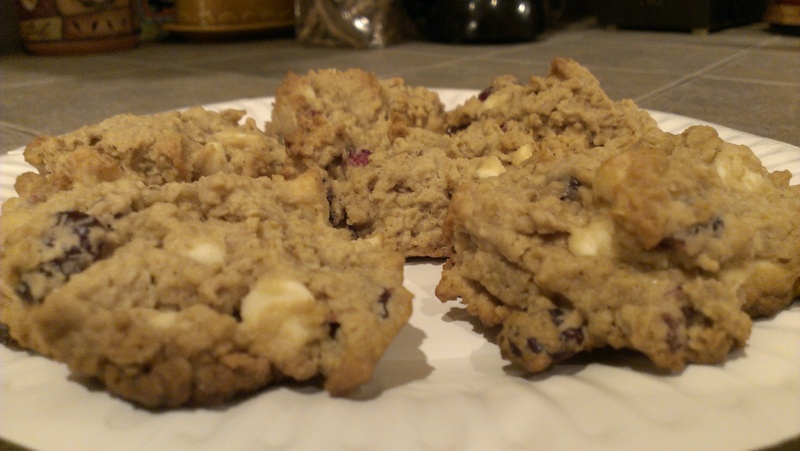 I’m a big fan of both cranberries and white chocolate, so these are right up my alley. Glad to see you finally making something instead of just taking the easy way out! Slackers. Hey! Does that mean the blueberry popovers, oatmeal nut waffles, baked scallops, and coconut torte – all homemade last week (one of those while scrambling to get to work on time) – don’t count?! Heres where you need my help. She should have used raisins and then frozen a few cookies until April! 2 birds with one stone. Nah…too easy. Besides, we’re all about variety, baby. Mmm, those look yummy! Although I think I’d just use regular butter if I made them (which I might! ).